We believe in creative play. At hopscotch the children are greeted first and there is a step stool for them to be able to talk across the counter just like everyone else. At hopscotch conversations about Santa, Fairies, Elves, The Easter Bunny, The Tooth Fairy, and even the binky fairy take place every day. 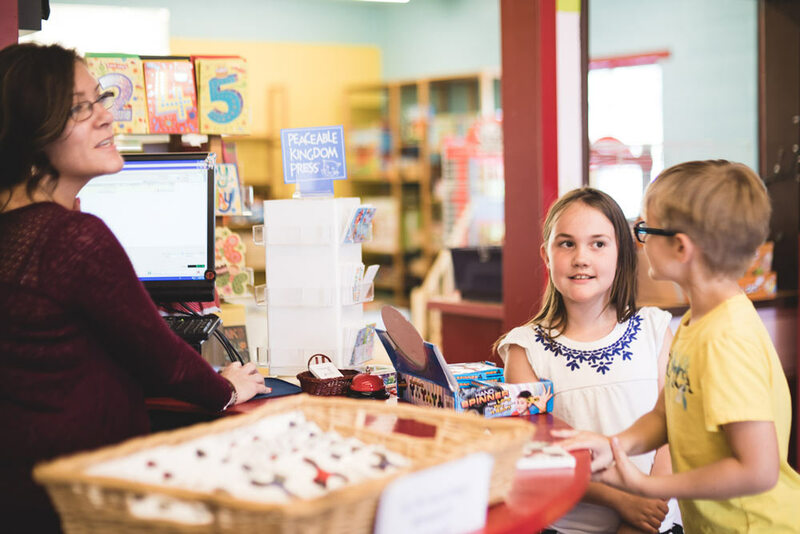 It is our hope that when our children grow up and make their decisions about what they want to support, the strong emotional bond that they are building in their neighborhood toy store will inform those decisions and make them more likely to invest in their local economy than send their dollars to MegaCorp. Why are you looking at me like that? You’ve never seen a bird in a toy store before? We believe in creative play. We choose to carry toys that encourage critical thinking, problem solving and imagination. The catch phrase in our industry is “open ended play”. What that means basically is that the child gets to dictate what the toy is and does. The toy does not tell the child what he/she is and should do. We believe that life should be one long series of small and large celebrations. We are so pleased that we find ourselves right in the middle of these so often. Birthdays, pee-pee in the potty, full star charts, good dental check-ups, great teacher reviews, and brave trips to the doctor. Thank you for so often choosing us to help you celebrate.